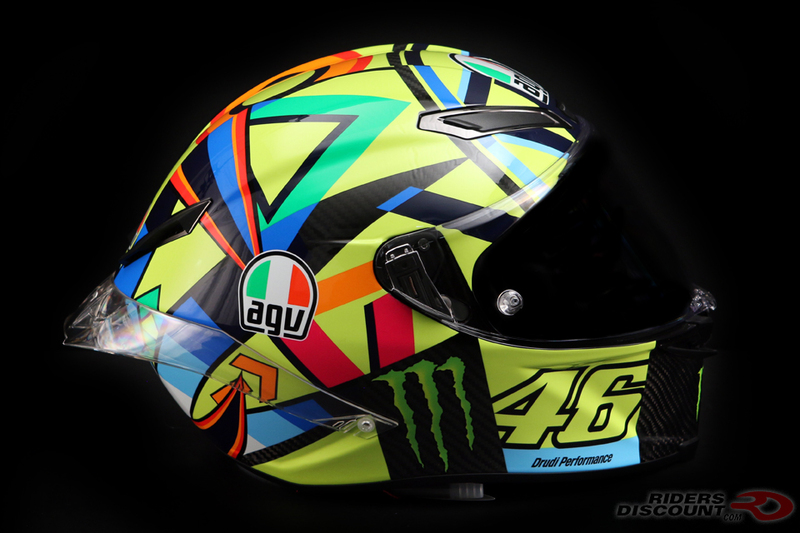 The AGV Pista GP R Soleluna Helmet features a similar geometric “Soleluna” (sun-and-moon) design to the one Valentino Rossi wore in 2016. 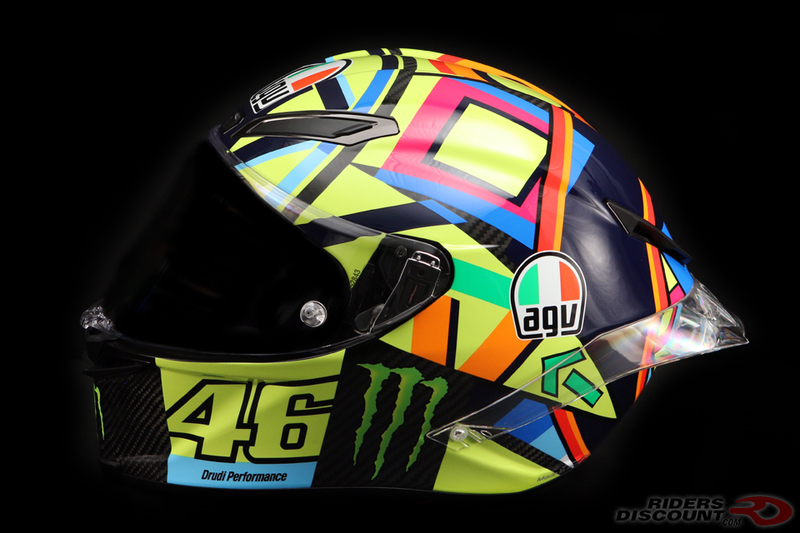 Developed with the help of Valentino Rossi and other professional motorcycle racers, the Pista GP R is the top race helmet made by AGV. 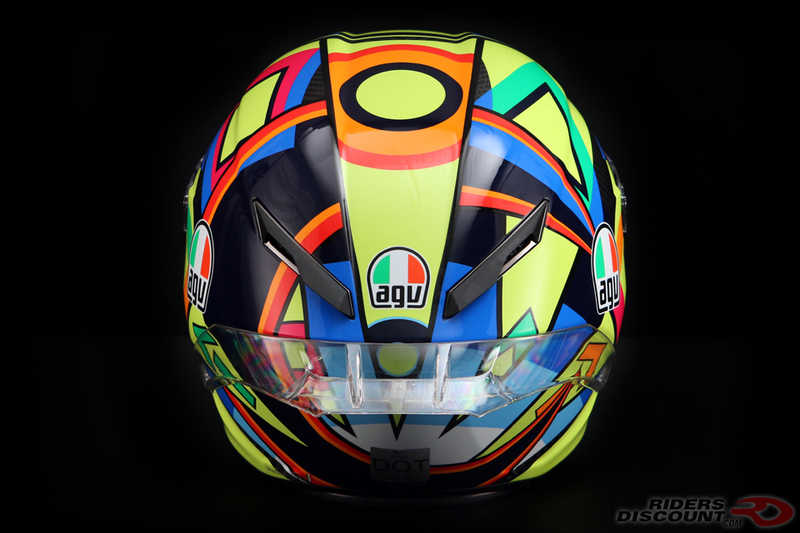 Both lightweight and durable, this helmet offers professional, race-quality protection. The shell of the Pista GP R is made entirely out of durable carbon fiber. 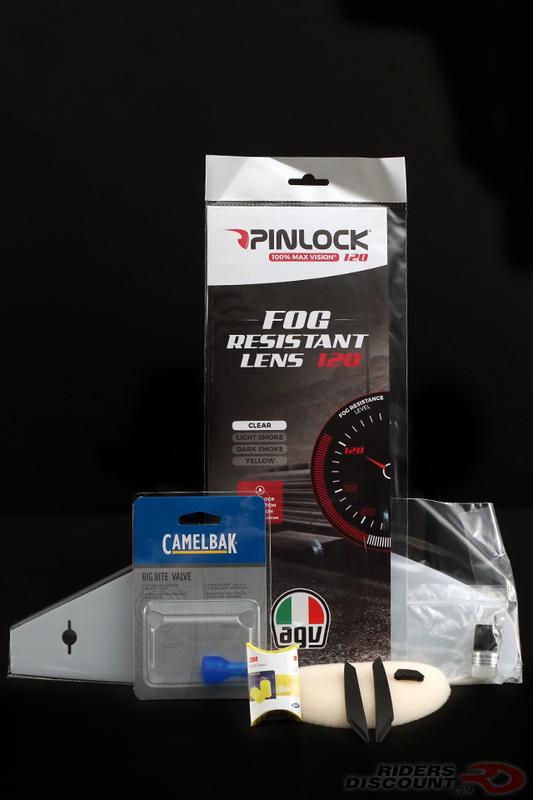 A special Visor Lock System (VLS) prevents the visor from accidentally opening in the case of a crash. To unlock the visor, you simply push a button. This helmet includes a clear class optic 1 visor with 100% Max Vision Pinlock 120 anti-fog technology that is tear-off ready. A tear-off kit is also included. The ventilation system built into this helmet is top-of-the-line with 5 large front metal air vents and 2 rear extractors, allowing cool air to enter the helmet and hot air to exit the back. Working along with the external vents is the Integrated Ventilation System (IVS). 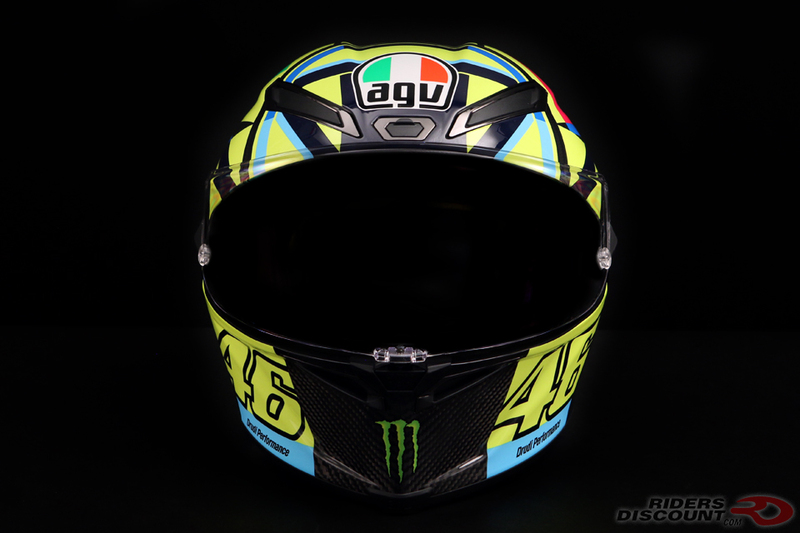 The IVS consists of hollowed out air ducts and vents that direct air to flow to the rider's head. The new "Biplano" spoiler on the Pista GP R has multiple wings for better aerodynamics and stability. 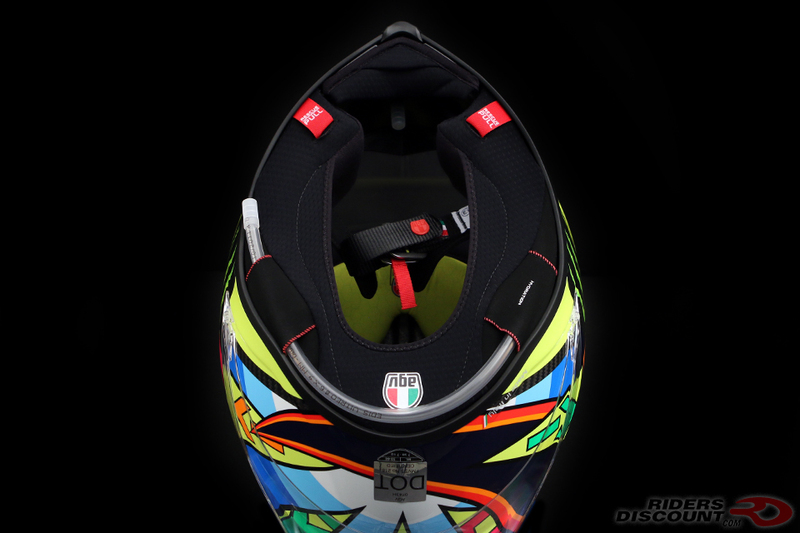 New and exclusive to the Pista GP R is AGV's integrated hydration system. Included is a Camelbak Big Bite Valve. The hydration system is removable if you prefer not to use it. The cheek pads and liner have sanitized antibacterial protection, as well as "2Dry" moisture wicking and Microsense treatment. Small, removable disks help to shape the interior specifically to each rider's head. The interior is completely removable and washable. If you have any questions about this product or would like to place an order, feel free to give TJ a call at 866.931.6644 ext. 817. Is email more convenient? Send us a private message through this forum or write to us at FORUM at RIDERSDISCOUNT dot COM and we'll get back to you right away! PM priced shipped to 78758. Thanks!! Last edited by mhal8876; 04-15-2019 at 03:07 PM.